« When does marriage begin? 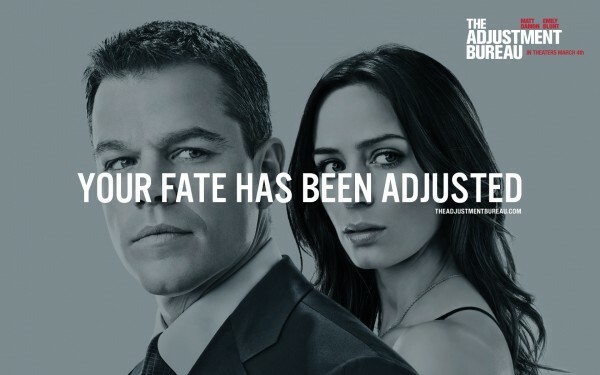 I got the chance to see The Adjustment Bureau today, starring Matt Damon and Emily Blunt, among others. And I have to say, I wasn’t dissapointed. I was previously a little bit hesitant about it being a good one, and in such situations, I download the movie from a file sharing site (I won’t name names, but you probably already know which one). But I can say, having watched it, I can say it has the quality worthy to be among the roughly thousand DVDs in my collection (meaning, I’m going to buy it on DVD in the next few months – I’ll probably wait until I get back from my vacation, though). It starts out nicely; Matt Damon is David Norris, a United States congressman running for the Senate. Shortly after losing the election, while preparing for his losing speech, he runs into a woman named Elise (Emily Blunt), who he almost immediately gets a crush on. After running into her again on the bus ride to his job at a law firm, he finds himself chased by some men in suits and hats on several occasions, who seem to have some weird influence on the world, and one of their objectives is to prevent David from seeing Elise again, for unknown reasons (at first; the real reason is revealed later in the film). This is quite a good “being-chased” action thriller, with certain religious overtones hidden behind it. But in contrast with the Left Behind series of books and films, The Adjustment Bureau tones this aspect down quite a few notches. I consider myself an agnostic, and I don’t like religion being thrust down my throat, as I felt with Left Behind (I bought the first movie of the series, more or less by accident, and without knowing what it was about – and I was severely disappointed and disgusted at the way a certain religious belief was being crammed down on me). Thankfully, this was not the case with this movie. The few religious overtones were introduced gradually, and, as I said, was being toned way down to a level that allows you to believe whatever the hell you want to believe. My personal belief is still intact, and I was left with a good feeling at the end of the movie. The movie also set “if you have enough influence, you can nudge someone in the direction you want them to” kind of mood in the “Grand Scheme of Things” (or, as the movie called it, “The Plan”), yet people are still free to make their own choices, even if it’s on an unconscious level. All in all, a good movie. Posted on 08.07.2011 at 01:17, categorized as blog, movies, reviews.